Information: The game will Switch to part 02 after your uncle left the house skipping the whole introduction sequence when you rescue Zelda. This code lets you increase the speed in case you have a special item (in this code the moonpearl but you can of course change that. LDA $0202 ; bow equipped? cmp #$04 ; silver bow and arrows? This is for making small key blocks like they appear in Link's Awakening. 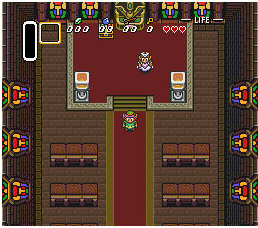 I will overwrite the prison door for that (like that one where zelda is behind). You only need to change the prison door graphic to a key block. The patch is "in place" so it doesn't overwrite other data or patches you added. The blocks can be opened from up- or downside only, left and right will not work (will try to fix this in the future). ;This is a "bugfix". In case there are in-room staircases, the game sometimes does strange things to the room counter. ;through a door since in this case the wrong neighbour room is loaded. SePH found out that the latest Version of HM can edit dungeon maps. So no need anymore to renounce on these. However, there's a small bug in HM; Caves are saved with FE (but FF is needed to disable the dungeon map call in caves). This assembly is a guide only - you need to cater it for your own hack in terms of the movement combinations/exit areas. The meat of the code is all the increment/decrement of ram addresses in the different cases where the same area needs to be loaded. PW uses a similar but little bit more inefficient version of this - so don't be surprised if the code doesn't match PW exactly. .zram counter ; stores the combination # the player is up to. I wrote a little patch that is good for testing. When pressing the "L"-button you will gain a maximum inventory (all items, the highest possible) and 50 bombs, 50 arrows, some rupees (not much cause cpu is in 8 bit mode when calling the hack, but this can be changed if wanted by someone), all hearts, 1/4 magic and so on. It is commented so you can easily modify it. Information: This asm lets you modify the conditions and items you start with when beginning a game. Here's a list of mini-hacks for PW you may or may not be even aware of. I also have the ganon hack but the notes are too much of a mess to post here.